Scientists from India performed an experiment to synthesize castor oil based acrylated derivatives to be used as potential lubricant basestocks. The acylated derivatives of castor oil, castor oil fatty acid methyl and 2-ethylhexyl esters were synthesized using different anhydrides in about 90–95% yield. All the products were structurally characterized using NMR and IR spectral data. 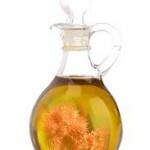 Results showed that castor oil could have use in hydraulic and metal working fluids and other industrial fluids with their wide range of properties.